Funny how you take your home town for granted until you've lived away from it a few years. I moved away from Frederick in the late 1980s. Now I find myself coming back to explore it - from ghost tours of Mount Olivet Cemetery to the latest, the 28th Annual "Holidays in Historic Frederick" Candlelight House Tour. The Candlelight House Tour is something I've been wanting to do for years. But with my luck, usually something else came up or I'd miss it, thinking it was one week and it had really been the week before. This year -- aha! Fortuitously, my mom, who still lives in Frederick, mentioned the tour in time for me to make plans to attend. 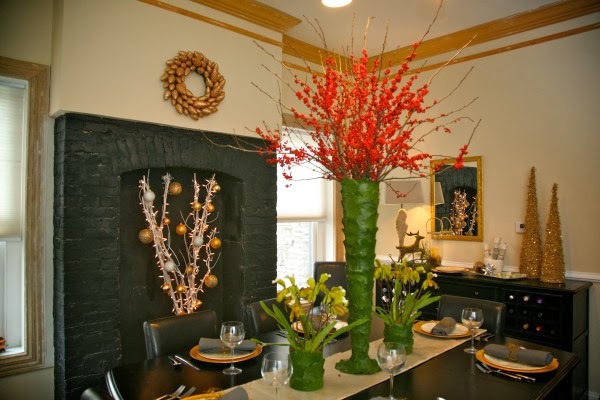 This year's tour allowed ticket holders to walk through Frederick's rich history, from the 1750s house museum Schifferstadt to mod 1950s homes, all decorated for the holidays. The eight homes were spread throughout the neighborhoods surrounding Baker Park, a lovely park that follows Carroll Creek through downtown Frederick. Proceeds from the candlelight tour fund many free public events that occur throughout the year in Frederick and more than $100,000 raised from the tour over the years have been donated over the years to beautify Frederick's historic district. The interior photos shown here are not from this year's tour -- these were picked from google images from previous years' tours, as photography inside the homes on the tour was not allowed. This prohibition -- understandable from the homeowners' perspective -- was both wonderful and torturous for me. Not being allowed to photograph freed me to just enjoy the sights and the houses. But the trees and decorations were so lovely and creative that several times I was tempted to sneak a photo to share on the blog. I bravely resisted the temptation! now an architectural museum open to the public. Built around 1758, Schifferstadt is among the best examples of early Colonial German architecture in the country. Because it was built at the beginning of the French and Indian War as frontier settlers abandoned their western Maryland farms in fear of raids from the French and their Indian allies, Schifferstadt may have provided refuge for families west of Frederick in times of need. The original owner of the land upon which Schifferstadt was built, Joseph Bruner, a German immigrant, and his family left their village of Klein Schifferstadt in 1729 in hopes of gaining independence, including the right to own property and build a home in the "New Land." He purchased 303 acres of virgin timber in 1746, cleared and farmed the land, and built a modest wood structure for his family home. Joseph Bruner named his farm Schifferstadt after his hometown in the Palatinate region of South Western Germany. Joseph's eighth and youngest son, Elias Bruner, bought the farm from his father in 1753, and built the stone farmhouse in 1758 that we know today as Schifferstadt. It was inhabited until around 1972. By then, much of the original acreage had been sold. The house had fallen into a state of disrepair, and it was suggested at the time that it should be torn down and replaced by a gasoline station. However, in July 1974, the owners sold Schifferstadt to Frederick County Landmarks Foundation, Inc. Although its exterior and interior have been altered over the years, Schifferstadt maintains many original architectural features. Christmas in Schifferstadt was celebrated much differently than we do now. Decorations were simple and were made of natural materials. There would have been a Christmas tree, probably decorated with candles. The other homes on the tour are worth mentioning as well -- but I'll pick out a few that stood out for me. Several of the homes on the tour were among Frederick's oldest, including the one at 111 Record Street. This historic brick home was built by Dr. Willliam Tyler for his family in 1815 and is the birthplace of William Tyler Page. Although he served for more than 60 years in the U.S. Capitol, he is best known for authoring The American's Creed*, which is still recited by new Americans as they become citizens. The tour took us onto all three floors. Although the uppermost rooms were not the most grand -- it was there that several tour participants all said, "we wish we could live here." With more than 6,000 square feet, this gorgeous home is a stately combination of Federal and Greek revival architecture that boasts 12-foot ceilings in the living and dining rooms and a grand stairway. Each room offered noteworthy architectural detailing. The floors as we walked through creaked in that "I'm a really old house" sort of way. And as we climbed the lovely staircases, I wondered, were these built to handle all these people on them at once? Luckily, the answer is yes! One of the neatest homes on the tour was 231 Dill Avenue, a cozy colonial revival built in 1900. It still maintains the original turn-of-the-century charm, with front and back staircases and pine floors. 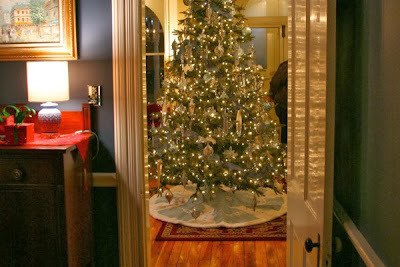 The Christmas trees in the house were wonderful -- these were the ones I so wanted to photograph to share on the blog. I also loved the PINK master bedroom. 203 Rockwell Terrace was built in 1910 as a neoclassical revival, foursquare design, brick and frame house. It was recently converted from two apartments into a single family home, but luckily much of the original detailing still exists, including the staircase, restored mirror, fireplace mantel, bay windows in the front parlor and the tongue and groove cheery wood flooring. Despite the formal decorations, the owners' sense of humor came through -- there was a Christmas tree created from paint swatches, a nod to the owners' design business. And in the mudroom, the collection of deer antlers was decorated with green Christmas ornaments and garlands, a fun surprise! It was so cool to see such a lovely house filled with quirky (but but still tasteful--a style I've yet to master in my own home) decor! Tip: If this tour sounds interesting, consider going on one of the two upcoming Candlelight Tours events. This first is coming up this weekend: the 25th Anniversary of Museums by Candlelight, a free holiday program. Frederick County’s numerous historic sites and museums provide visitors with a living reminder of the area's past. During Museums by Candlelight, there will be special programming and hands-on activities for visitors of all ages, and special children's activities are featured at most locations. This is a self-guided event. Visit many locations, or just a few, in any order. Enjoy period demonstrations, living history vignettes, hands-on crafts, refreshments, tours, music, holiday decorations and historic settings by candlelight as night falls. But that's not all. Celebrate Frederick's local history and religious diversity on December 26 by taking the 27th annual Candlelight Tour of Historic Houses of Worship this holiday season in Downtown Frederick. As the sun begins to set, visitors can tour many of Frederick’s famous clustered spires and other historic houses of worship by candlelight. At a dozen sites, guests will be welcomed with special programs, angelic choirs, and nativity scenes. Getting there: Check the appropriate web sites for where and when the tours are offered. Schifferstadt is located at 1110 Rosemont Avenue, Frederick. 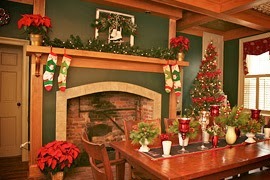 Hours: The candlelight house tours are two-days a year, in early December. Keep an eye on the Celebrate Frederick website, Visit Frederick website, or this blog's FB page for information about future tours. Schifferstadt Architectural Museum is open for weekend tours, April through early December, Saturdays and Sundays, 1 pm to 4 pm through December 8. Eats: Lots of great little restaurants in downtown Frederick to chose from. I believe in the United States of America as a government of the people, by the people, for the people; whose just powers are derived from the consent of the governed; a democracy in a republic; a soverighn Nation of many sovereign States; a perfect Union, one and inseparable; established upon those principles of freedom, equality, justice, and humanity for which American patriots sacrificed their lives and fortunes.